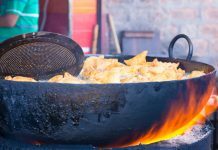 Home Topics of Interest Foodgasm 11 Mouth-Watering Turkish Street Foods That You Must Try! Situated at the crossroads of Europe and Asia, Turkey has a fusion of Central Asian, Middle Eastern, Eastern European and Balkan cuisines on its plate. Even throughout history, it has acted as a barrier and a bridge between the two continents. With its Ottoman Empire heritage, one can see the reciprocal influence between Turkey and its neighbouring countries. 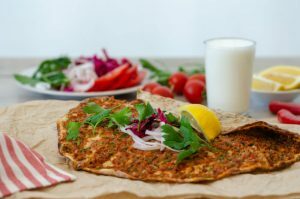 Bringing in a variety of dishes in this cuisine, we give you a list of delicious Turkish street foods that will not only satisfy your taste buds but will also be easy on the wallet! Also Read: You’ve Heard of Baklava, Now Try These 11 Traditional Turkish Desserts! 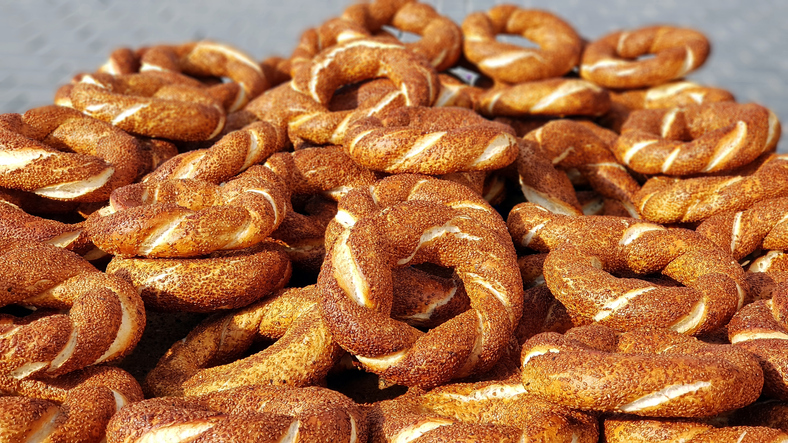 Popularly known as Turkish Bagel, Simit is circular bread that is covered in sesame seeds making them crunchy on the outside and chewy on the inside. A perfect on-the-go breakfast, Simit are most commonly sold on the streets, displayed in small covered carts or small stands, and sometimes are simply carried by a walking vendor with simits piled high on his head. Have it with some cheese and ayran (a cold savoury yoghurt-based drink). 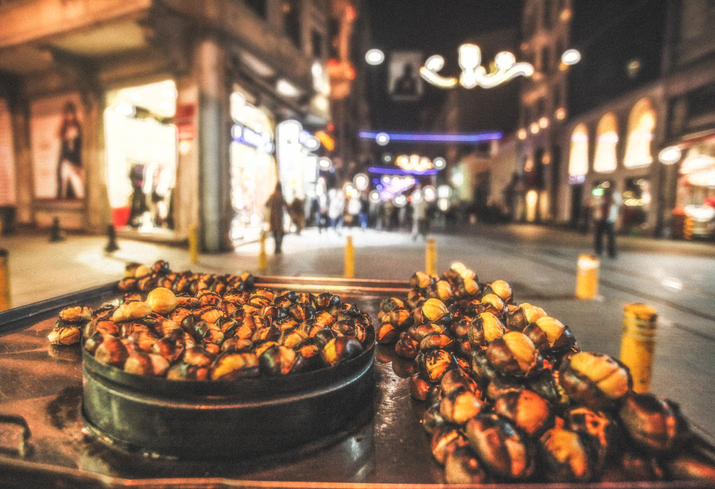 Mussels stuffed with herbed and spiced rice, pine nuts, known as Midye Dolma are commonly found at the streets of Istanbul. 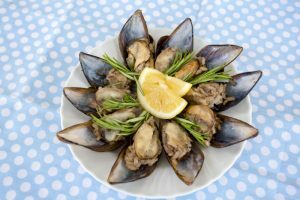 One of the most popular street foods, these are served with half a shell of mussels, mixed with spiced rice and the occasional addition of currants. Do not forget the squeeze of fresh lemon! Cooked with tomatoes, green chillies, onions, parsley and skewered lamb’s intestines; it is one of the spiciest Turkish street foods. Usually served with either half or quarter loaf of bread, this greasy delicacy can overcome all your preconceived notions with just one taste! 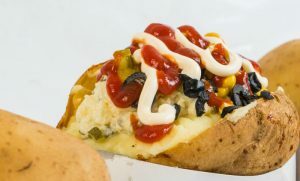 Kumpir is the ultimate baked potato that’s cut in half and filled with your favourite toppings such as black-green olives, cheese, corn, pickles, tomatoes, cabbage, mushrooms, mayonnaise, and ketchup—making this extremely delish and healthy! What more could you ask for? Originally from East Europe, Börek came to Turkey with the Ottomans. 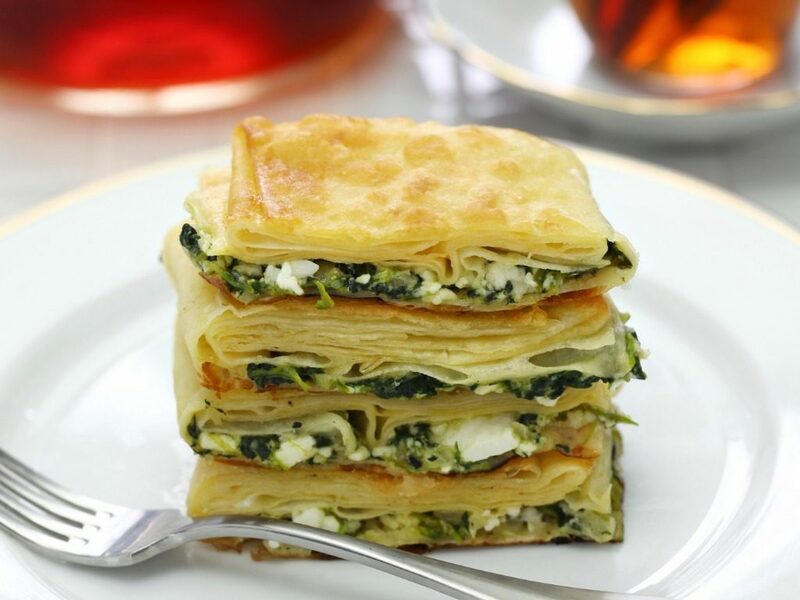 This flaky pastry is made from the phyllo dough which is layered with fillings of spinach, cheese, minced meat or potato. With many variations available, you can try them all as a tea-time snack or a quick breakfast. Known to the foreigners as “Turkish Pizza”, Lahmacun is thin oval shaped dough topped with minced meat, tomatoes, onions, parsley, spices and red pepper according to your liking. Bake the dough and serve it piping hot with a handful of parsley and a squirt of lemon juice. 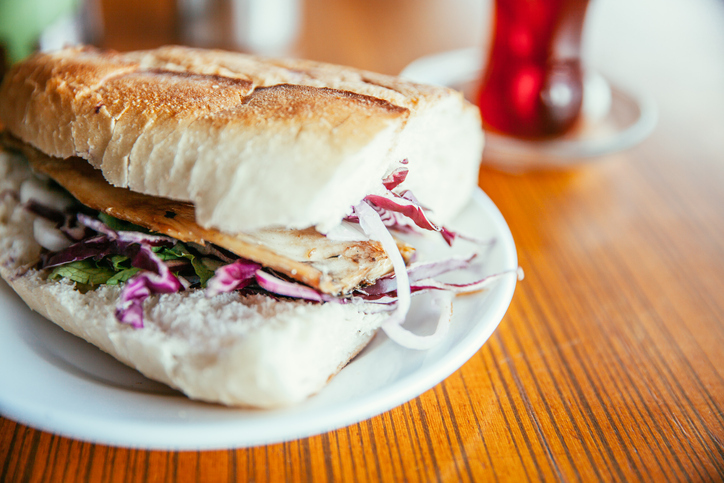 One of the most common street foods of Istanbul, Bali ekmek is a grilled fish fillet sandwich. 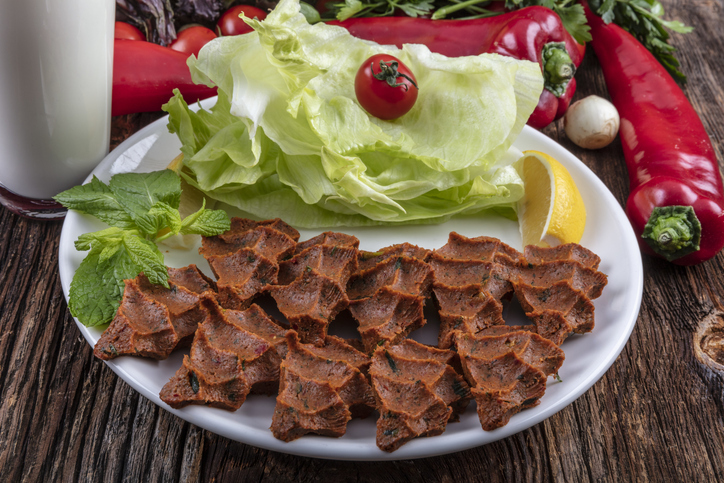 Can be served with assorted veggies, lettuce and onions by the side; Balik Ekmek tastes tangy and spicy and a must eat when you are holidaying in Turkey. 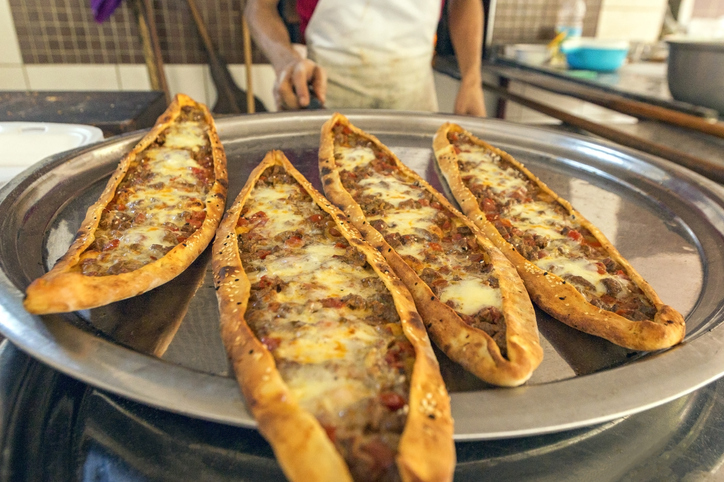 Though Pide and Lahmacun look similar, they are not the same. Pide is made with a thick oval flatbread topped with a wide variety of vegetables and cheese toppings. 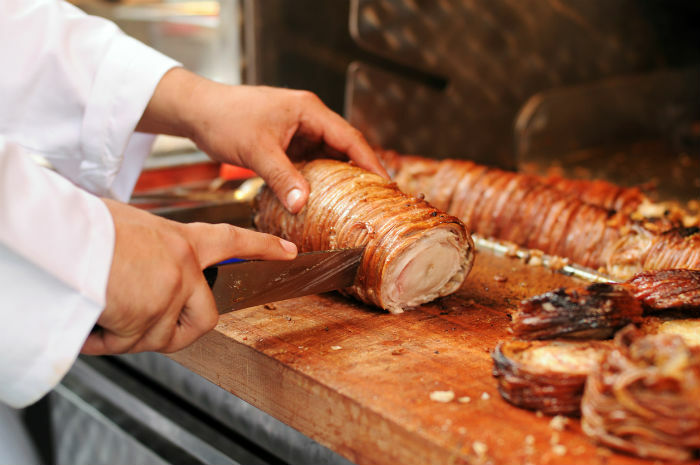 While it varies from region or region, the most common fillings would be ground beef with eggs or cheese, pastirma (air-cured meat), kavurma (meat fried with suet and salt for later use), roasted beef, mushrooms, and spinach. 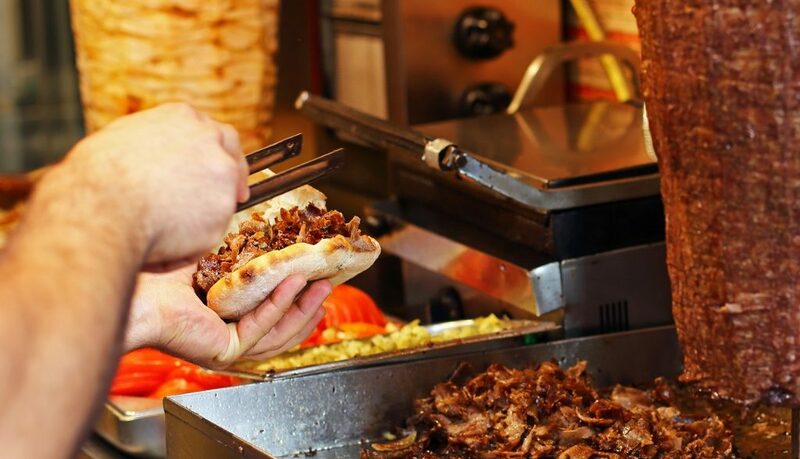 This Turkish wrap is one of the traditional dishes of Istanbul and is very similar to the Döner Kebab. It features Chicken or beef along with some grilled peppers and tomatoes—which is then, served in lavash bread. Be sure to mention the level spiciness and enjoy Dürüm’s unique taste while you are visiting Turkey. Kestane, or roasted chestnut, is a popular street food in Turkey, especially in Istanbul. This sweet snack is a bit like a baked potato in texture but with a nutty and sweet flavour. You can also find candied chestnuts, or kestane șekeri, which is a speciality of Bursa. Roasted chestnuts are usually sold by weight. Pronounced as “chee kofte,” Çiğ Köfte literally means “raw meatballs”. Traditionally, it was made with either beef or lamb; but in vegetarian versions maybe served with kneaded bulgur, scallions and spices. These savoury balls are generally served wrapped in a lettuce leaf or thin flatbread with all kinds of green garnishes and fresh lemon juice. Experience the delicious local Turkish street foods with the dishes mentioned above; and do let us know about your foodgasm-ic experiences in the comments below!